Stories are being told about your company all the time. Unless you have never had a customer, someone somewhere is talking about your company. When they do so, they are speaking with passion either for or against your business. You need to have your passionate stories ready to add to that conversation. To create raving fans in your business, you need to be a raving business. When a customer experiences your company, they leave with an impression. If they were offended, hurt or feel they did not get good value, they will passionately talk about (create the story of) their perceptions of your business. Likewise, if you exceeded their expectations, they will also talk about that story. When a person hears one of these customer stories about your business, do you have your own equally passionate company stories to counter or confirm? Can your customers find these passionate stories on your website via video or audio links? 1. Do not be afraid to be full of passion about your product or service. For example, I am always amazed at the way small brick-and-mortar business owners can be so alive and excited about their offerings but yet have zero expressions of that anywhere on their websites, other advertising or in casual conversations. Real passion ignites real passion. Don't tell me that you're "passionate about the perfect cup of coffee" at your coffee shop. Rather, through business storytelling, show me your passion by telling me the story of how you spent a year travelling the country to find the best and most unique roasting machine. I want to see that look in your eyes as you tell me about the best/worst coffee you ever had that led you to start your own business. Let me laugh with you about your obsessive interviewing and auditioning in order to find the perfect baristas. Help me to feel your focus as you tell me about going through a dozen suppliers (and their unique personalities) looking for the perfect coffee beans. 2. Your employees are your best source of truth about your company. Train your employees in ways to gather and collect their own company stories. Then, on a regular basis, gather employees together to share these stories. The sharing of these stories must not be mandatory. Requiring employees to have a story results in faked stories. By the way, my clients will sometimes hesitate to use this story-gathering process with employees because the session will generate "nothing but complaints" from the participants. All stories have value to your company and if you are getting lots of complaints, let those stories be the catalyst for internal change. Take the cue to understand: if your staff is producing uncomfortable stories, then you can be assured that your customers are unhappy, too. 3. If your company is very large with multiple locations or large departments, start your storytelling process in just one section of the company. Nothing squashes passion more than yet another management project that "we are all going to do." Choose one department and let them be the first group to experience the power of business storytelling. 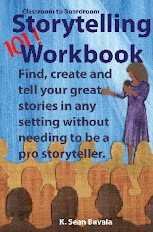 Once they have learned and applied storytelling techniques successfully, then other departments or locations will want to join in. 4. The elevator speech is dead. For any size company, learn to tell each of your stories in a variety of time formats such as two minutes, six minutes or fifteen minutes. Always be ready to tell potential customers about your work. Your preparedness will help convey your passion. 5. Remember that storytelling is a person-to-person experience. Take every opportunity to be in front of customers or employees to tell your stories. Digital storytelling, print advertisements and social media are all fine tools, but they can never replace the benefits of experiencing your story passionately told live and in person. Storytelling is one of your business communication essentials. Add passion to your public speaking! Sean Buvala is a storyteller and corporate coach focusing on communication skills through the art of storytelling for business. He can be reached at www.seantells.net . You may also follow him on Twitter at @storyteller. 12 Reasons Why Artists Should Attend the Performing Artists' Open Conference. 12 Reasons Why Artists Should Attend The "Performing Artists' Open Conference" This August! Please distribute! Join us this August for the first annual "Performing Artists Open Conference," where we skip the pretense of choosing workshops for you and YOU could be one of the chosen speakers- chosen by your peers. Why Should Southwest artists attend? 1. Retreat #1. You need a retreat before the school year starts. Many artists (and those who support and love the arts) have their work deeply connected to the school year. So, before the new year begins in full, come spend a few days learning with your peers, taking some chances learning and presenting. In our open-conference environment, you will be challenged. 2. Retreat #2. Okay, maybe you just finished the killer "library show" season and you need to clear your mind, be with adults and think anew about your art form. You know, a shared meal table is a great place to start conversations that will make you think. 3. Real Conference, Real Close. Many artists and staff (in the West and Southwest) love the fun and professional growth inspired by conferences, but find it hard to find something local that is accessible due to issues with money, location, or relevance. Some other artists, new to being a working artist, are hesitant to spend gobs of travel money just right now. So, before you pay to jet out to across the U.S, no matter your experience, come learn in your own backyard. 4. Networking. We are not just inviting folks connected to one type of performing arts, but rather all performing arts. Sit next to someone who does something you do not do. Explain what you do. Learn what they do. Create a collaboration and invite us all to it if you want. Alternatively, just talk about life. Do you know every artist in the state yet? 5. Staycation. If you are in the Southwest, we are next door! Why not stay over Friday night and/or Saturday at the huge discount room rate of $79 per night? You don't have to share a room to get that rate- that is single occupancy! You can GET AWAY to focus on your art without having to do all that getting-away work. You do not have to stay at the conference hotel, but why not make it a gift for yourself? 6. New Ideas. We are asking YOU and others to bring their best presentation, discussion, performance, round table ideas. What do you want to talk about? Not ready to lead a workshop? Then- propose it anyway as a discussion group and get everyone's creative juices flowing. Come on- do not fear! DO something with your great idea. A conference like this typically lets you be affirmed in some areas and challenged in other subjects. By the way, you are not required to submit a workshop or discussion idea. Just come and participate if you want. 7. Tax-deductible? In most cases, continuing education for working artists is tax deductible. Check with your tax pro because we are not tax pros. 8. Early Bird for Everyone. Look, we want you to be there. We need at least 10 people at the early bird rate of $209 to pay for this event. Register by August 1 for this rate. You get two lunches, registration and other surprises for this fee. …in the subject line. You will get an even lower rate and the instructions on how to claim it. Act now. 10. Pad Your Resume. At the moment, we are going to be a smaller and more intimate group. Small group= more chances to get your proposal fit in. Your proposal accepted= you can add the "PAOC Presenter" to your growing resume. 11. Honest Feedback. A conference like this has no stars, only friends and peers. Come offer your best work and ideas. Get honest feedback to your presentation by others who know the same challenges of presenting for and with artists. No need to pretend to know it all, just share what you know. Or, just absorb it all. 12. Experienced Staff. Yes, we know, this is about you, but we have been putting on events like this and others for decades. Despite the fluid nature of the event, we are totally prepared to be sure you do not have to worry about facilities or other nonsense. We've also chosen a place where good places to eat dinner (across the budget spectrum) are within walking distance for you and your old and new friends that you met back in #4: Networking. We are not spending a zillion dollars of your money on PR. We are being light hearted and casual in this note, but we want you to come spend some time with this exciting new conference. You can reap the rewards for taking a new path at the PAOC this August 21-23, 2009. Details:::> So- Artists and Friends of the Arts, please learn more at www.artistbootcamp.com . "Sean Buvala is a storyteller who teaches, speaks, and coaches organizations on the value of the story for understanding their culture, their people, and advancing their cause. Meet Sean and hear tips on the how and why of storytelling. www.seantells.net, www.storyteller.net, (33 minutes)"
You can listen in to the interview in the player below or go directly to the EP site at this link now. To download the mp3 file, use this link here.